He's Got That Mardi Gras Vibe! Given our location tucked into the base of the mighty Sangre de Cristo mountains just south of historic Santa Fe, Que Sera Farm is an extraordinary place to visit in this land of enchantment called New Mexico. 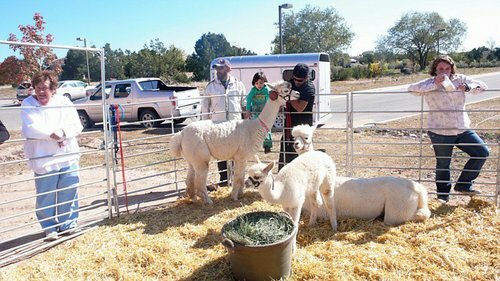 With this state's climate being perfect for the fleece-producing alpaca--cool summer nights and cold dry winters--it is also pleasant for visitors. Que Sera is a working farm, and here we stand firm by our commitment to continue breeding the finest Huacaya alpacas. We'll introduce you to our primary herdshire, Atair's Vito, who was born with a 17 micron and who at 66 months was the Color Champion at the 2010 Great Western Alpaca Show. You will also be able to meet the babies as well as the junior varsity crowd. 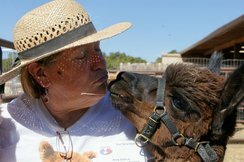 Broonie is our kissing alpaca (pictured below), and this sweet creature delights everyone! You'll be able to check out our fiber processing area, where self-proclaimed fiber nerd Anne will show you how she sorts and grades alpaca fleeces. If you are an experienced breeder, come take a look at our herd. We are proud of its show quality stock both for fiber and for pets. Or if you are thinking of adopting this lifestyle as your own, let us show you around and answer your questions. Explore alpaca products and see for yourself the versatility of these wonderful creatures. Experience a visit to Que Sera Alpaca farm for yourself and see what all the fuss is about! Broonie is our kissing alpaca, and this sweet creature delights everyone! Not long ago, driving past a field of alpacas in the United States would have been a jaw-dropper. But it is becoming more and more common to see these exotic creatures in the fields of small farmers all over the United States. So what is it about alpacas that is making them a popular livestock choice? Originally bred in South America, alpacas are raised for their fiber, which is warmer than wool by weight, softer and more comfortable than cashmere and is surprisingly strong for a luxury fiber! An adult alpaca can produce 8 to 10 pounds every year. Unlike sheep's wool, however, processing alpaca fiber is quite expensive . This is one of the reasons we also breed alpacas, and also because we are passionate about breeding the very finest animals. There are two types of alpaca, the most common being the Huacaya. These alpacas look very fluffy because their fiber is crimped. I tend to think of them as chia pets! The other type, the Suri, has smoother, twisted locks – like ringlets – that is lustrous and very silky. One of the most appealing things about alpacas is their demeanor. They can be shy but, are not aggressive toward humans (though the males will sometimes fight one another for dominance). Another part of their appeal is how quiet they are. Soft food pads enable them to walk very quietly in pastures, which makes them not only peaceful creatures but also very easy on the environment. They don’t tear up the pastures the way sheep and goats do. Their normal speech consists of an easy humming sound but they can screech a bit if they are mad. And they have a very effective “alarm” cry which is loud and unmistakable. When I hear that I go see what’s got them riled up. Some people claim they actually have "calming power" over humans and I find them very therapeutic! Jacinta - Blanket, 5/6/09 - Pete Connelly or Mike Morgan, not sure - Que Sera 2.5 lbs Medium Brown Female Above average density, not much brightness, fairly flat crimp style but there is bundling. Grade 4 - probably about a 27 micron. 2" - 3" taple. This fleece had a poor handle although it was consistent. It was very dry and very dusty. Jacinta - Neck 5-12-10 - Mike Morgan, I think - Que Sera Medium Brown Female Very similar to '09 fleece. Jacinta - Blanket, 5-5-11 - Cody Fifield - Que Sera - 2.3 lbs Medium Brown Female Grade 4 - about a 28. 2" - 4" staple - a little longer than '09 fleece. also has better handle, not so dry and dusty. better brightness, good density - well above average and pretty fair architecture. A lot went to rug - primaries seemed stronger and fleece was really badly shorn - staple cut in half in lots of places and huge wads to chewed up noiles. thanks Cody. Jacinta - Neck, 5-5-11 - Cody Fifield - Que Sera 1.4 lbs. Medium Brown Female - chopped to hell and gone - nothing salvageable. Jacinta - Blanket, 5-17-12 - Pete Connelly - Que Sera 2.1 lbs - Very dry, short staple, primaries more prevalent. Great rug fiber. River Jordan - Blanket, 5-10-10, Mike Morgan, I think - Que Sera 2.4 lbs. Medium Brown Female - cria fleece - skirted for show. Fleece show score 69.5 - inconsistent crimp style, too much VM, may have hurt her handle score. average density, super staple length 4" - 5" in about 8 mos. growth - Yummy. WR 1 - 18 - 19 micron. River Jordan - Neck, 4-23-11, Ric Metcalf - Que Sera 1.4 lbs. Medium Brown Female OMG second cuts are so bad I want to cry! WR and WL 1, some WL2. most is unusable. Jacqueline - Neck, 5-17-12, Pete Connelly - Que Sera 1.1 lbs Dark Brown Female - 12 year old female with 8 offspring. 2" staple, no character, good density, average brightness. 26-27 micron WL4 but most is too short to process into yarn. It was also very dirty and rather chopped up. Dusty Moon - Blanket, shear date unknown, shearer unknown, Turquoise Trail alpacas - 2.8 lbs White Male I believe this must be a "younger" fleece than the previous fleece. It is smaller and the micron is finer. Density, brightness and architecture very much the same between the two fleeces. Again, strong presence of primaries, secondary fibers grade at about a 20 micron, but primaries are strong enough to create problem with processing. Longer staple, can process as WR. Not sure what to do. Dusty Moon - Neck, shear date unknown shearer unknown, Turquoise Trail Alpacas - 2.8 lb.s White Male. Yep - I reweighed it - 2.8 lbs of neck fiber. Badly chopped up with second cuts - why don't the shearers get that neck fiber is perfectly useable if they don't chop it to bits! Density is off the charts - explains the weight I suspect. The fleece seems less bright than the others and the secondaries are stronger - 23-24 micron - again loaded with strong primaries. Still, I suspect this may be an "older" fleece. Short staple. Processed some to WL$, but most was trash or rug due to second cuts. Benita - Blanket, 5-4-11, Pete Connelly - Dando Luz Alpacas - 2.6 lbs. White female. this fleece was skirted for sale and has been in the showroom for while. Solid WL4 - average brightness, Very dense, great architecture. Tips are a little brittle, negatively impacts the handle but good consistency throughout. Very Sweet Little Unknown Fleece - shear date unknown, shearer unknown, owner unknown - .9 lbs. White. I think this is a cria fleece, have no idea where it came from. BADLY chopped up with 2nd cuts - maybe a neck fleece. Grade 1, 17 - 18 microns. VERY dense, beautiful architecture, uniform crimp, good handle. 3" to 4" staple. Sure wish I knew who grew this fleece - very pretty. Cocoa Pelli - Neck, 5-5-11, Cody I think. Dando Luz Alpacas Medium Brown Female - 1.9 lbs. Horrible shearing job - tons of second cuts - staple cut in half in most places. Very dense, great architecture, above average brightness, fairly consistent Grade 2 - a real shame - this was a nice fleece. Gabriella - Blanket, 5-15-11, Cody Fifield, Dando Luz Alpacas, Medium Brown Female - 2.5 lbs. More second cuts than there should be - surprising fineness. Mostly Grade 2, 3" - 4" staple, very poor architecture, no crimp, no brightness, very soft handle. Primaries are relatively small. I wonder if the fineness and the poor architecture contributed to the second cuts - no bundles, no crimp - it was "floppy" on the animal. Just a theory, but I do find that second cuts seem to be more prevalent in the finest sections of fleeces, especially if there's inconsistency in the micron. Jeanie's Dream - Neck, 5-17-12, Pete Connelly - Dando Luz Alpacas - 1.6 lbs. White Female Big change from previous year - WL 4, more rug fiber than previous year - still dense and well organized. Golosina (Golly) - Neck, 5-17-12, Pete Connelly - Que Sera .9 lbs White pregnant female Surprising - bad second cuts - what was salvageable was WL4. She has really developed strong primaries. Theresa Marie - Blanket, 5-4-11, Cody Fifield - Que Sera - 2.0 lbs. White female Super fine, WR1, VERY bright, lovely character, great density really nice fleece - WOW - love the long staple. Soleil - Blanket, 5-4-11, Cody Fiefield - Que Sera - 2.4 lbs. White female This fleece was skirted for show and for sale - it has been in the shop for several months. Yikes - it is very dirty - what was I thinking! Average brightness, wonderful architecture - Grade 2, mostly WR - has a wonderful handle in spite of the dirt and great density. Theresa Marie - Neck - 5-17-12, Pete Connelly - Que Sera - 1.5 lbs. White Yearling Female Mostly WL2 - about 80%, the rest was WL 4 or Rug. Very consistent, good density, very bright. 2nd cuts not too bad. Jeanie's Dream - Neck - 5/4/11, Cody Fiefield - Dando Luz Alpacas 1.6 lbs. White Female OMG! beautiful fleece - very badly shorn. Grade 1 - 4" staple - I think it may be under 17! LOTS went to trash due to 2nd cuts. Probably only salvaged about 60 % Super density - very uniform character. Soleil - Neck - 5-17-12, Pete Connelly - Que Sera 1.2 lbs. White Female Nice Fleece - about equal parts WL1 and WL2. like the crimp style - good uniformity, well organized, great density and brightness. Treno Relampago - Neck 5-15-11 - Pete Connelly - Dando Luz Alpacas 1.9 lbs White Male - Grade 5, good volume, above average density. Bit of a surprise - he makes nice babies Processed to rug.